This November, WinStar World Casino and Resort will have a shopping event that you won’t want to miss. With the holidays quickly approaching, now is the perfect time to get a head start on your shopping list. And while you’re here, make sure to treat yourself, too! 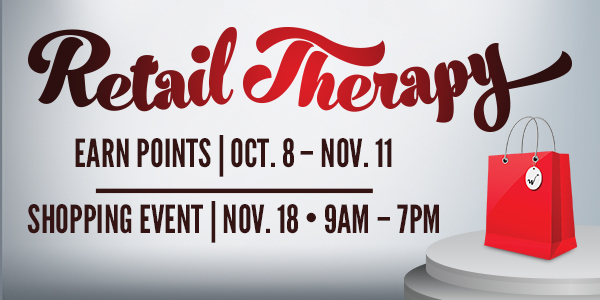 Oct. 8 – Nov. 11, play at WinStar Casino to earn rewards for Retail Therapy. What is Retail Therapy, you ask? It is a shopping experience like no other that will be held in MIST Nightclub, located in the Beijing Gaming Plaza. Shop from a variety of items including gloves, fuzzy socks, bags, Rustic Cuff products, speakers, cookware and more. There will be something for everyone on your shopping list! Now that you know about this can’t-miss shopping event, you need to learn how to earn your rewards. Visit WinStar from Oct. 8 – Nov. 11 and play your favorite games to win points. Ten points earned on your Club Passport card is equal to one dollar in Retail Therapy Rewards. If table games are more of your style, play 15 minutes of live rated play with your Club Passport card and earn one dollar in Retail Therapy Rewards. The more you play, the more Retail Therapy Rewards you’ll win. Once you’ve earned all of your rewards, come back from 9:00 a.m. to 7:00 p.m. on Nov. 18 to shop ‘til you drop! With all of the rewards you win, you’ll save on some of this season’s hottest items. While you’re here, make sure to check out our other shops and enjoy a great meal from one of our many dining options. You can also plan some time to play your favorite games and stick around to relax and enjoy live entertainment at one of our lounge areas. Complete your shopping trip and purchase tickets to our upcoming shows here at the Global Event Center. Jerry Seinfeld, ZZ Top and Harry Connick, Jr. are some of the amazing acts you can see. Play, win and shop. It’s as simple as that. Start earning your rewards now! We’d love to hear about your favorite things you get during Retail Therapy at WinStar. You can connect with us on Facebook, Twitter or Instagram.